Survivalists — and the US Army — have a whole list of guidelines to help you figure out what’s safe and what’s not to eat out in the wild, but that’s a lot to remember and the chances of it sticking with you are slim-to-none. Start with remembering these things to stay away from: plants with a milky sap, an almond-like scent, anything with pods, spines, thorns, or thin hairs, and a three-leaf pattern (think poison ivy). There’s also something else that’s key: white and yellow berries are bad. Purple and blue ones are probably (but not always) okay, and red berries are something of a crap-shoot. If you think you’ve found something that might be a legitimate food source, start the edibility tests. First, hold a piece of the plant on your skin to see if there’s a reaction — this usually takes only about 15 minutes. If all is well, do the same on your lip, then tongue. If it’s still all good, chew — but don’t swallow — and wait 15 minutes. If there’s no irritation, swallow a bit… and see what happens. Over the course of eight hours you’d start to see any negative effects, and if there’s none, then you’ve just found your dinner. There are plants with milky sap when wounded they emit it. Usually, this milky sap is poisonous and causes symptoms like skin irritation, nausea, and itchiness but there are few plants, which are harmless and used for medicinal purposes. Most of these milky sap plants are wild that attract bees and butterflies and repel pests. 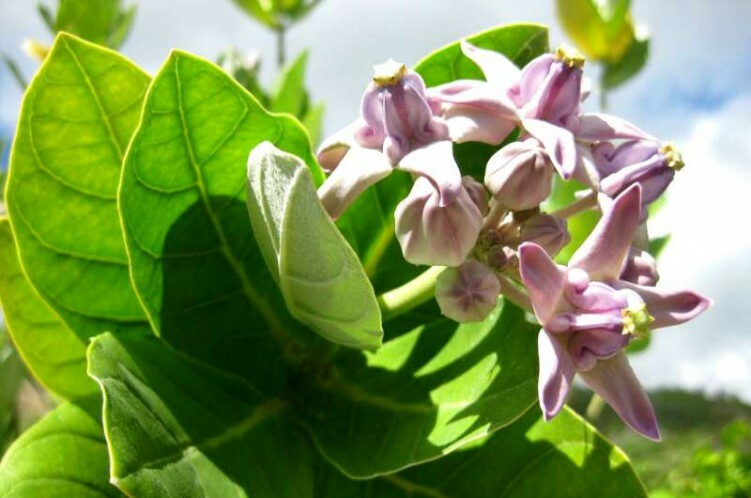 Calotropis grows as a weed in South East Asian countries, it’s a tall shrub and used in rituals and traditional Ayurveda to increase vigor and in curing diseases like a cough, cold, nausea, and asthma. The plant has thick waxy leaves and sticky lavender-white flowers that lure bees and butterflies. When its leaves are plucked, it releases viscous milky white sap that is poisonous and its contact with eye causes loss in vision. Ficus family has more than 800 species of plants and most of them emit sap. The sap release from ficus is latex and seep out when the plant is pruned. Wearing gloves at the time of dealing with ficus tree is important as it can cause skin irritation and itchy eyes, which escalates more when exposed to the sun. It’s a wildflower and considered as a weed. It thrives in the dry and poor soil. It blooms in warm summer and spring and attracts a wide range of pollinators like bees and butterflies. When its foliage snapped or picked, it emits white sap, which is poisonous when ingested. Euphorbiaceae is a large family of flowering plants. It grows in part shade and produces a red colored flower. Plants of this genus are deer resistant and pest repellent. Similar to milkweed, it releases sap from broken foliage or stem, which can cause skin rashes. Mildly sedative, used as a medicine, wild lettuce is not poisonous. It’s a beneficial herb. Wild lettuce is native to Europe and West Asia, its cream-colored sap ooze out from wounds in the plant, which is collected for medicinal purposes. Its sap contains ‘lactucarium’ which has sedative, antispasmodic, hypnotic and narcotic properties. Papaya is one of the most nutritious fruits grown in tropical part of the world. Its young fruit and stems release milky white sap, which is also not poisonous. It is used in Ayurveda and recently it’s proved that its sap contains anti-cancer properties. Poppies are tall annuals grown for their beautiful large red, yellow and white flowers. All parts of this plant are toxic. 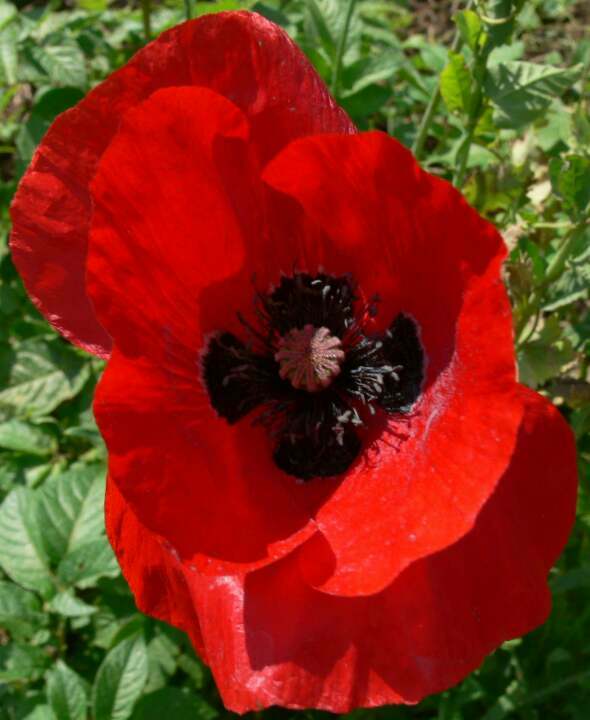 One of its species (opium poppy) contains opium, it releases sap and is used to produce heroin and other drugs. Beautiful and mildly scented and low maintenance oleander flower plant is a charm of subtropical and tropical gardens. Oleander branches and twigs emit milky sap (contains a toxic called ‘Cardenolide Glycosides’) when plucked or pruned, though this is harmless when touched, but beware— when ingested, it can be harmful to stomach. Always wash your hands carefully after working with oleander. Let’s say you’ve gone and gotten yourself lost in the woods. Assuming you know whether you’re in the northern or southern hemisphere (and if you don’t, you have bigger problems), you can use your watch as a compass. Technically, we’re talking about analogue watches with actual hour- and minute-hands. But if you’ve gone digital, you can still use the same principle by using a little bit of imagination when it comes to picturing where the hands would be. First, if you’re in the north. Point the hour hand at the sun, and imagine a line running halfway between the hour hand and 12 o’clock on your watch. That’s pointing to the south, and the rest of the directions you can figure out from there. If you’re in the south, stand so 12 o’clock on your watch is pointing at the sun. Halfway between the sun and the hour hand is north. That’s so easy to remember that it kind of makes all those movies where the heroes wander in circles look a little bit silly, doesn’t it?